Oarai (大洗 Ōarai) is a town in eastern Ibaraki Prefecture, located in the Higashiibaraki District not far from Mito, the prefectural capital. A fishing port and tourist centre on the shores of the Pacific Ocean, it is known for its swimming resorts and coastal scenery. The local population, around 20,000 inhabitants, live of the town’s port (with two daily ferries to Sapporo in Hokkaidō), its fisheries and fish processing industries (clams, sardines, whitebait, sardines, and flounder), and tourism. 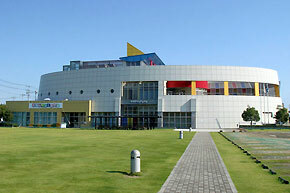 The Japan Atomic Energy Agency maintains a Research & Development Center (大洗研究開発センター) in Ōarai, housing the Jōyō reactor, an HTTR reactor, the Japan Materials Testing Reactor, an environmental reactivity monitoring centre, and the Waku-Waku Science Museum. Ōarai offers a lot of activities to its visitors: beautiful sandy beaches for swimming and surfing, dolphin watching, sea cruises, but also golf courses, a camping ground, a famous aquarium, and a few museums. The Ōarai Isosaki Shrine (大洗磯前神社), devoted to a guardian deity of safe sea voyages, is well worth a visit, too. 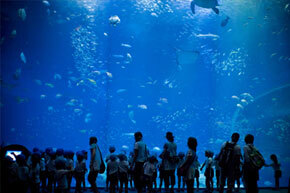 Aqua World is a large aquarium right on the Pacific shores, displaying over sixty tanks of different marine species. Also contains a Sea Life Museum. Admission: 1,800 JPY, 900 JPY (children 7-15), 300 JPY (3-6), group discounts available. Open daily 09:00-17:00. The Bakumatsu Museum documents, exhibits, and dioramas of the late Tokugawa and the early Meiji periods, as well as personal effects of the Meiji and the Taisho emperors. 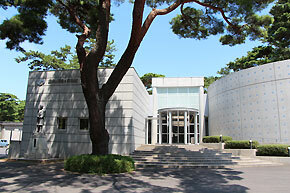 Admission: 300 JPY (free for students, discounts available); open 09:00-16:30. 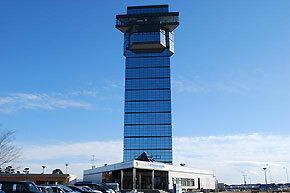 The 60-metre tall Marine Tower in the Port of Oarai, Ibaraki Prefecture.